The American Studies Association (ASA) has come under fire over the past year for endorsing an academic boycott of Israeli academic institutions. Recently, there has been speculation that the organization may have backed down from its initial threat. However, the ASA website clearly points to the opposite by stating that subsequent reports that the ASA had changed its policy regarding the academic boycott were erroneous. [i] Further, the organization asserts that it “has a long standing commitment to social justice and believes in the power or nonviolent strategies, such as boycotts and divestment movements, as a tool to effect political, social and economic change.”[ii] Resorting to a boycott of academics, who devote their lives to producing knowledge and engaging in meaningful dialogue, is evidently erroneous in its own light. The past ASA conference in November was also not shielded from criticism on this issue. One panel in particular “sought to explore such questions as the role of political ideology in academic debate, whether the Israel-Palestine conflict is within the purview of the ASA, and whether academic boycotts are a legitimate means to political ends.”[iii] This debate has been embroiled in controversy since it first arose and these feelings were not absent from this panel, which highlighted the importance of academic debate in an open and welcoming environment. Barring academics from institutions, regardless of the domestic and foreign policies from one’s nation, is not a legitimate approach. Obstructing such meaningful discussion is a danger to the academic world and the production of knowledge. It may be too early to evaluate the impact of the destructive endorsement on the part of the ASA. Regardless, the message that it sends can endure and reach beyond the means of an academic conference. Simply put, those in favour of the boycott will not enter into formal collaborations with Israeli institutions. [iv] The ASA claims that it is not endorsing a boycott of Israeli scholars, but of the wider Israeli institutional framework. [v] How it is possible to separate one from the other is not immediately clear. Moreover, it is also important to ask why the ASA has not endorsed the boycott of institutions from other countries around the world engaging in gross human rights violations ten-fold in comparison to Israel. Syria, for example, which has been caught up in a civil war for several years in which the death tool has reached thousands, has managed to fade within such as discussion. Within a larger context, it may seem that ASA’s endorsement of a boycott of Israeli institutions does not have much power. After all, it is an organization made up of approximately 5000 members and surely a large number of these scholars do not agree with this decision and may even strongly oppose it. 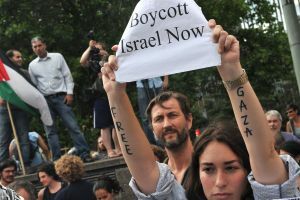 Nevertheless, anti-Israel boycotts are on the rise and are gaining momentum. With every war, the mobs grow larger. The efforts of Israeli troops to halt missile attacks into Israel have led to the deaths of many innocent Palestinians while those responsible often escape unscathed. It has become a common occurrence to turn on the television and hear of horrible news coming out of Israel about fierce warfare and ultimately death in some cases. As a result, Israelis have become targets around the world and, to some extent, so have Jews. The establishment of the state of Israel does not hide the fact that Israelis, and Jews, continue to be vulnerable and are viewed by many extremists as legitimate targets of war. In France, some Jews fear for their lives and are leaving the country. [vi] In one recent attack assailants stormed the apartment of a young couple, had raped the woman, and stole jewelry as well as bankcards. [vii] The victims were told by the attackers that they were not chosen at random, but because they were Jews. [viii] Irrespective of whether this attack was partly due to recent events in Israel, it is becoming clearer that the Jewish people are being threatened globally. Individuals and cultures around the world must be respected. In the same light, so must values and beliefs as long as they do not cause demonstrable harm to others. Boycotts do cause harm and often to unintended victims. One case occurred only a few months ago. The Soda Stream factory in the West Bank was moved to Lehavim in the Negev region less than one year after an intense boycott campaign. [ix] Although Soda Stream claims that the move was purely for economic reasons, the BDS movement hailed the closing of the factory as a victory and hundreds of Arabs lost their jobs within the company. [x] The harsh boycott evidently had some strength, as is often the tragic case. Those who seek change should turn their attention elsewhere and work to promote tolerance and diversity among Israelis and Palestinians instead of further dividing the lines on both sides. Such a noble attempt will surely lead to positive change to some degree. This will likely not erase the objective realities of mistrust on both sides. Further, it will also likely not prevent those who go to extreme lengths to destroy any efforts at peace. However, the reality is that Israel as a Jewish democracy is not going anywhere and must be recognized in order for an eventual Palestinian state to be created. Organizations such as the ASA must accept such a reality and work towards positive change in the region through other, and more valuable, means. Dana Gold is an SPME Fellow and this essay was written for SPME.